Over the weekend, I shared a brief video to Instagram that featured a homemade pair of pull-up handles that I’ve used for many years. I first demonstrated the handles on this site back in 2011. In the time since, the handles have been quite handy, particularly when I’m traveling away from home. I’ve literally used these pull-up handles on doors around the world. It’s clear that there are some new readers to the site however. In the two days since sharing the latest video, my inbox has filled with questions about the pull-up handles. With that in mind, I believe a brief entry will be useful to address some of the most commonly asked questions. To begin, the collage below includes a few pictures of the handles as well as a video demonstration. As you can see, the straps from the handles rest atop the door. The door is then closed to secure the handles in place. 1. How did you make the handles? The handles are made from 3/4 inch PVC pipe. Each piece of PVC is approximately five inches in length. The yellow material (lashing straps) that runs through each piece of PVC was cut from the end of a homemade suspension trainer. The lashing straps that I used to build the suspension trainer were quite long so I was able to cut 30 inches from each strap. I simply ran the lashing straps through the PVC and securely knotted the material to itself (creating a strong loop). 2. In the pictures, it appears as if there is duct tape wrapped around the lashing straps. What does the duct tape do? When I first built these handles, I wasn’t sure if the PVC would eventually dig through the lashing straps. Therefore, I wrapped duct tape around each corner as an added layer of protection. Looking back, it probably wasn’t necessary, but there’s nothing wrong with taking some extra precautionary steps. 3. 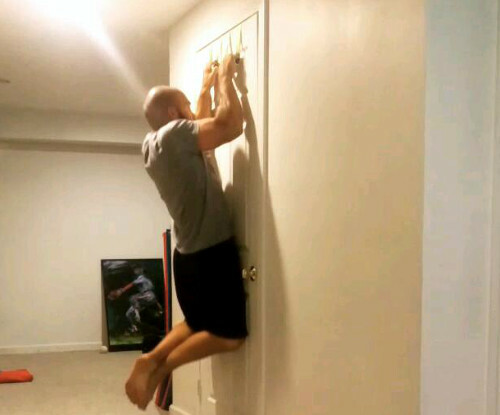 Isn’t it dangerous to perform pull-ups from a door? Naturally, it’s important to use a sturdy door when performing this exercise. As for durability, I’ve tested these handles with over 1000 reps on the same door. There hasn’t been a single problem with the door or handles. You can read more about the 1000 rep test in the 2014 entry. 4. Aren’t pull-ups from these handles easier since you are sliding up the door? Speaking from experience, you won’t suddenly perform more reps than you would from a regular bar simply because you are pulling from a door. The fact that you are in contact with the door doesn’t provide assistance. On the contrary, the door eliminates any potential swinging that one might use to gain momentum. Strict reps are the only reps that you can perform from these doorway handles. 5. Why does your thumb appear to be on the side of the handles when performing reps? When pulling from these handles, you’ll quickly realize that you must adjust the position of your fingers and thumb to avoid getting crushed against the door. Simply assume a grip that will allow you to comfortably pull yourself up. 6. What’s the point of making these handles when doorway bars are so readily available? I didn’t make these handles to replace my doorway pull-up bar. I first made these handles so that I could continue to perform pull-ups while traveling with my athletes. It isn’t practical to pack a doorway pull-up bar in a suitcase. These handles are much more convenient. In addition, I’ve had several readers of the site mention using handles like mine on doors that don’t have the trim needed to hold a doorway bar. 7. Do you performed weighted pull-ups from these handles? As stated above, I built these handles to allow me to perform pull-ups while traveling. I do not use them as my primary means of pull-up training. Instead, they serve as a valuable addition that I use when necessary. To conclude this entry, these doorway pull-up handles have proven to be incredibly useful for me over the years. Pull-ups have always been an integral part of my training so it’s nice to be able to perform the exercise when traveling. I wouldn’t suggest using these handles as your sole means of pull-up training, but it’s always nice to have additional options available. If you have any additional questions about the handles, feel free to shoot me an email. Clever. I think we need some of these for exercise breaks in the office! That right there is a genius idea. Would be perfect for some Grease the Groove. I do fingertip pullups on the door frame. There’s always a way. 😀 😀 RLY GOOD! Never seen something like that. TheyÂ´re so practical and do not require space. That looks great. I have been looking for something similar as I would like to avoid mounting a bar in my 100 year old apartment:-) Do you know where you can buy them? Btw, if you do it on the other side of the door, then it forces the door to close even more. You will further not put pressure on the closing mechanism. You could make them yourself following the instructions in this blog post. The materials would be relatively cheap. Great article, pull ups are a staple of my daily routine, the strength gain from them is amazing, love the compound effect thast it has on the major muscle groups. I recently manged to pull off my first muscle up and I can do two in a row now, looking for 10 by the end of the year. Thanks for sharing this, it was an awesome read! Interesting. I have seen people also do this by pulling out the door, then holding onto the top as they do a pull up however that is a little too dangerous and impractical for most people. Your idea is better. I’ll have to give it a try, because I am still trying to find a solution to not having a pull up bar with me when I travel. There goes the door hinge..
Or not 🙂 Thanks for posting this. What’s your thought on power powers? They looks sturdier than doorway pull up handles. But would love to know your insight? And if I were to get one myself, do you have any recommendations? There are too many websites about power powers from Google. Apples to oranges, but power towers are fine. I’ve shown one in my Never Gymless book as well as some past videos. There’s more models than anyone could ever remember though, so I’d just suggest reading over some Amazon reviews and staying in the $200 price range. No need to go higher IMO.